When talks of the greatest NBA teams of all time come around, we often hear about the 1967 Philadelphia 76ers, the 1972 Los Angeles Lakers, the1983 Philadelphia 76ers, the 1986 Boston Celtics and the 1987 Los Angeles Lakers to name a few because those teams dominated the regular season and playoffs from start to finish. But for whatever reason, one of the greatest teams ever often gets lost in the shuffle because of the era in which they played. Indeed, the 1996 Chicago Bulls boasted the best ever regular season record (72-10) and also flexed their muscles during the postseason, going 15-3 in the playoffs on their way to the NBA title. The argument against the 1995-96 Bulls is that they played in a diluted era; with two expansion teams joining the league that season (Toronto and Vancouver) whereas the legendary teams from years prior faced better rosters from top to bottom and also required more Hall of Fame caliber players on their squads to win a title. Have a look at some of the teams that have unilaterally been accepted as being part of the top 20 greatest teams ever and the players on these respective teams that were inducted into Springfield. 1971 Milwaukee Bucks: Kareem Abdul-Jabbar and Oscar Robertson. 1972 Los Angeles Lakers: Wilt Chamberlain, Gail Goodrich and Jerry West. 1983 Philadelphia 76ers: Julius Erving and Moses Malone. 1986 Boston Celtics: Larry Bird, Dennis Johnson, Kevin McHale, Robert Parish and Bill Walton. 1987 Los Angeles Lakers: Kareem Abdul-Jabbar, Magic Johnson and James Worthy. 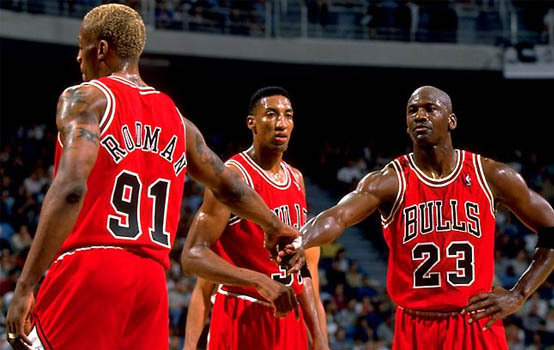 The 1996 Chicago Bulls on the other hand only featured two of the greatest players the league has ever seen in Michael Jordan and Scottie Pippen and arguably the best rebounder in NBA history in Dennis Rodman. And thus, many feel that this Chicago team cannot occupy the top spot because they lacked quality players at their other positions. The 1995-96 Bulls were 39-2 at home during the regular season, 10-0 at home during the playoffs, closed out opponents by an average of 12.8 points in the playoffs and sported a 10.6 average scoring margin throughout the postseason. And yet, prominent basketball writers such as Peter May and Jack McCallum left them out of their top two teams of all time (May kept them out of his top five altogether). It’s almost as if the 1990s were completely discounted in favor of romanticizing the past or what is known as the “good old days of basketball”. May offers a good point but then again good teams were a little more loaded in the 1980s whereas the bad ones had less talent to work with in comparison. Indeed, if we have a look at the 1985-86 and 1986-87 NBA seasons, in those respective campaigns, only seven teams won 45 games or more. Mind you, during the 1995-96 NBA season, 11 teams either reached or surpassed that total with Chicago (72), Seattle (64) and Orlando (60) all eclipsing the 60-win mark. And thus, perhaps the talent was a little more watered down during the mid-1990s, however one could argue that it was more spread out across the league and consequently made the league itself a little more competitive as a whole. The 1980s offered a few good teams, a few bad ones and a host of mediocre squads whereas the 1990s presented more good and bad teams and less mediocre ones. With that said, since it’s widely accepted that the teams from the 1980s had more talent for the most part (1983 Sixers, 1984 Celtics, 1985 Lakers, 1986 Celtics, 1987 Lakers and 1989 Pistons), it stands to reason that we compare the 1996 Bulls to the best teams of that decade: the Celtics and Lakers. The 1995-96 Chicago Bulls may not have had a Hall of Fame player at every position, but they still did pretty well throughout the season when matched up against quality opponents. The Bulls’ success in those days hinged on their ability to shut down perimeter scorers with quite possibly the greatest perimeter defender the league has ever seen (Pippen), attack both the offensive and defensive boards, force turnovers to get out in transition, crisp passing and execution to create high percentage shots and asking the greatest closer in league history to take them home late in games (Jordan). There is something to be said about a team without a dominant center achieving such success in the NBA. If we look back through the league’s rich history, every great team featured one of the signature big men (such as Kareem Abdul-Jabbar, Wilt Chamberlain, Moses Malone, Kevin McHale, Robert Parrish and Bill Russell) of their era but the Chicago Bulls ignored these facts and simply went about their business with two elite perimeter players and dominated the league. Keep in mind, the 1995-96 Chicago Bulls may have been revered by most fans around the league, but they still faced a giant bulls-eye on their backs during the entire season because teams geared up to beat them given their status, popularity and pedigree. In that sense, this Bulls team faced the pressure and expectations of the 2010-11 Miami Heat (of having to win it all) and yet managed the best regular season record in NBA history on their way to the crown. Their performance from start to finish (regular season and postseason) prompted ESPN’s John Hollinger to pick them as the greatest team of all time, and truthfully it would be hard to argue otherwise. 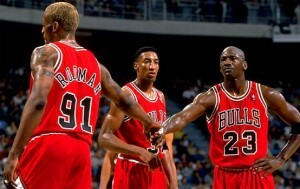 Could they defeat any of the best Lakers and Celtics team? It’s debatable. Dennis Johnson couldn’t guard the 1986 version of Jordan (MJ lit him up for 43.7 points per game in the 1986 playoffs) and thus would struggle to do so against the 1996 version. Pippen and Rodman would give Larry Bird and Kevin McHale fits on defense while the Bulls’ former star forward would exploit Bird’s lack of lateral quickness when matched up on offense. The 1986 Celtics would have a huge advantage at center and with their bench players, but the Bulls would keep the game close enough with their defense and rebounding for Michael to get into a duel with Bird late in the game where things could go one way or another. The 1987 Lakers would offer an intriguing and glamorous match up against the 1996 Chicago Bulls but could ultimately fall short. Michael Jordan would torture the likes of Byron Scott and Michael Cooper while Pippen would be able to assert himself offensively against the likes of James Worthy. On defense, the Bulls’ small forward would guard Magic to take away his post up opportunities and wear him down by picking him up full court while Jordan would probably focus his defensive efforts on shutting down James Worthy. Ron Harper would be called upon to defend Scott. Kareem Abdul-Jabbar would get an opportunity to feast on the interior because the Bulls would single cover him with the likes of Luc Longley, Bill Wennington and Dennis Rodman. One wrinkle that could prove to be the undoing of the Lakers would be the Bulls half-court trap; which would force Magic to give the ball up to teammates and watch them try to create plays for themselves or others. Ultimately the Lakers-Bulls battle would come down to MJ versus Magic in the clutch and that’s a battle where one would have to think Jordan would emerge victorious, be it with his scoring or playmaking. These scenarios are obviously nothing more than “what ifs” thus one could easily argue that both the 1986 Celtics and 1987 Lakers would defeat the 1996 Bulls; but the fact that Chicago is even in the discussion tells us all that even if we cannot say with certainty that they were the greatest team of all time; they are most certainly in the discussion. 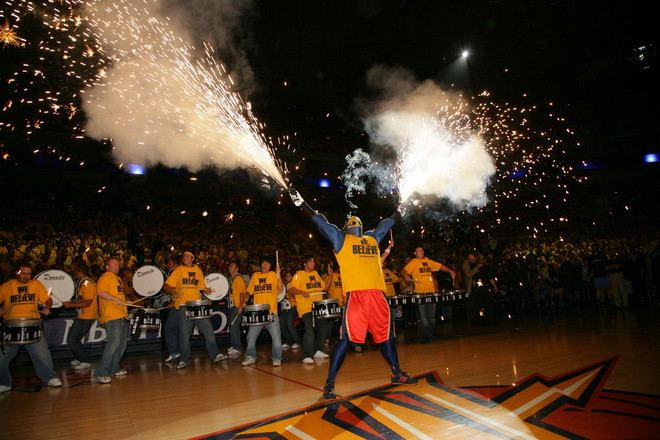 King in the Clutch: Monta Ellis?